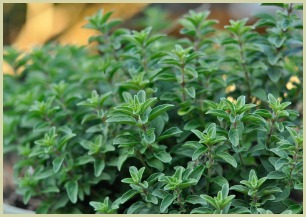 The Oregano Plant | Many Culinary Uses and Tastes Great On Pizza! The Versatile Oregano Plant - Many Culinary Uses and Tastes Great On Pizza! The oregano plant (origanum vulgare) is part of the mint family (Lamiaceae). The name comes from the Greek "oros", which means mountains, and "ganos" means joy. So literally translated means “joy of the mountains”. Originally from the mountainsides of Greece, Italy and other warm Mediterranean countries, the versatile oregano herb is one of the most widely used ingredients in the world. Its popularity soared when American soldiers who fought in Italy during WW2 brought it home with them and gave it a nickname “the pizza herb”. After the war, sales soared by more than 5000 per cent, and have remained high in America ever since. More on the history. ...In Britain, oregano (origanum vulgare) growing wild is called “wild marjoram”, whilst in Europe, the same herb growing wild is just called "oregano". The oregano plant is a perennial and grows up to 80 centimetres tall and blooms with small pink or purple flowers, which are also edible. Although the leaves themselves taste best when harvested before the plant flowers. 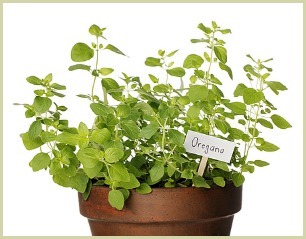 If gardening and growing your own is your thing, here are some tips on how to grow oregano. You can use the leaves fresh or dried. Incidentally, this is one herb in which the drying process doesn't affect the flavour or potency. This herb is the delicate flavouring in pizza and tomato sauces, delicious on grilled chicken, and flavourful on sliced tomatoes in a Greek salad. The leaves are widely used in Italian cuisine, as well as Spanish, Portuguese, Syrian and Turkish cooking. And it's used a lot in French cuisine, no bouquet garni or fines herbes would be without it. It's also a welcome addition to breads and a lot of dough recipes. I often add the dried leaves to my chapatis and tortillas. For something a little different, you can even make a tea with it. This is an excellent way of enjoying some of this its many health benefits. See my tea recipe. Note: There is a variety called Mexican oregano which is similar, but despite its name, is actually a different plant and not related. If your recipe calls for Mexican, do not substitute with Spanish, Italian or Greek oregano. They do have distinctly different flavours. Read more on this type. You can buy the oil which is extracted from the leaves of origanum vulgare. This oil has many health benefits and uses. See the benefits of oil of oregano page for more info on this.